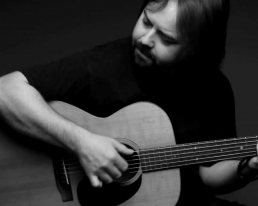 Vin Downes began studying guitar at the age of eleven. His early interests were in electric guitar, but this all changed when he heard the opening notes of David Cullen’s “Along the Way” on a Windham Hill Records guitar sampler. He immediately immersed himself in the fingerstyle music of Will Ackerman, Michael Hedges, David Cullen and Leo Kottke. Greatly influenced by the music of artists on Windham Hill Records in the late 1980’s, Downes furthered his interest of fingerstyle technique and composition by earning a degree in classical guitar performance and music education from William Paterson University. While at WPU, he studied classical composition and had several of his compositions performed by soloists and ensembles, including the New Jersey Percussion Ensemble, Helix Ensemble and members of the Composer’s Guild of New Jersey. Vin Downes has released four studio albums, two of which were produced by Grammy Award winning guitarist and producer, Will Ackerman. He is currently a performing member of “The Gathering – A Concert Series presented by Will Ackerman”. He has recorded and performed with musicians including Will Ackerman, Tom Eaton, Michael Manring, Eugene Friesen, Liz Story and Tony Levin. Vin Downes is a public school music teacher in New Jersey, where he currently teaches classical guitar at Bayonne High School.